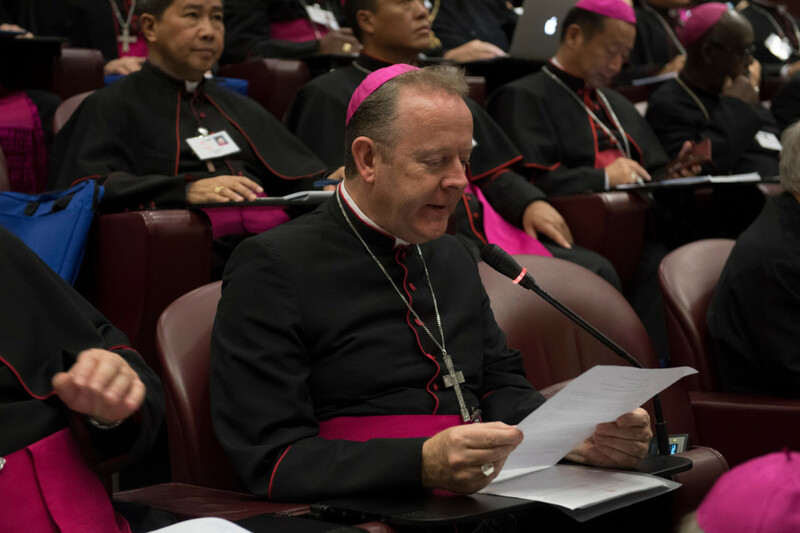 On Wednesday, 10 October Archbishop Eamon Martin told the Synod on Young People, Faith and Vocational Discernment that by reconnecting with young people, we can bring fresh joy and enthusiasm to the mission of the Church. Archbishop Martin of Armagh and Bishop Donal McKeown of Derry are representing Ireland at the XV Ordinary General Assembly of the Synod of Bishops which is taking place in Rome from 3-28 October. Archbishop Martin is Relator (reporter/secretary) of English speaking Group A. Speaking on Wednesday Archbishop Martin said: “At the final Mass of the World Meeting of Families in Dublin, Pope Francis remarked that it is ‘the Spirit of God, who constantly breathes new life into our world, into our hearts, into our families, into our homes and parishes’. He said that ‘each new day in the life of our families, and each new generation, brings the promise of a new Pentecost, a domestic Pentecost, a fresh outpouring of the Spirit, the Paraclete, whom Jesus sends as our Advocate, our Consoler and indeed our Encourager’. “In other words, it is the Holy Spirit who ‘rejuvenates’ the Church. That is why I would like us to speak more about the work of the Holy Spirit in the lives of our young people. For me, the Working Document lacks the punch and fire that the Spirit brings! Did you realise that Baptism is only mentioned three times in the entire Document and Confirmation is not mentioned at all? “I’d like to hear more of the joyful language of the ‘new springtime’, the ‘new Pentecost’ which every Pope since the Council has called for. As our new Saint (to be) Paul VI famously said: ‘The Church needs her eternal Pentecost. She needs fire in her hearts, words on her lips, a glance that is prophetic (General Audience 291172)’. “I am convinced that the Spirit is already actively at work preparing us for a new springtime of growth and abundance in faith. During the recent abortion referendum in Ireland many young people showed extraordinary courage by being ‘ambassadors for life’ despite enormous peer pressure to do otherwise. They were responding to the Holy Spirit challenging them to get right out of their comfort zones in the service of something much bigger than themselves. Similarly, at the World Meeting of Families we met thousands of young people in the ‘Teen Global Village’ who were clearly filled with the gifts of the Holy Spirit. “How can we encourage our young people to be more alert and open to the Holy Spirit, calling them and ‘gifting’ them for the service of the Gospel? Every day I pray for vocations to the priesthood and to the consecrated life. But I also pray that all our young lay faithful will find ‘new life in the Spirit’ and realise more and more that they are called personally by Baptism and Confirmation to be part of the ‘new springtime’ for the faith. It is the Holy Spirit who can enable them to embrace their unique role in the new evangelisation.